5. These shoes are completely adorable. 4. 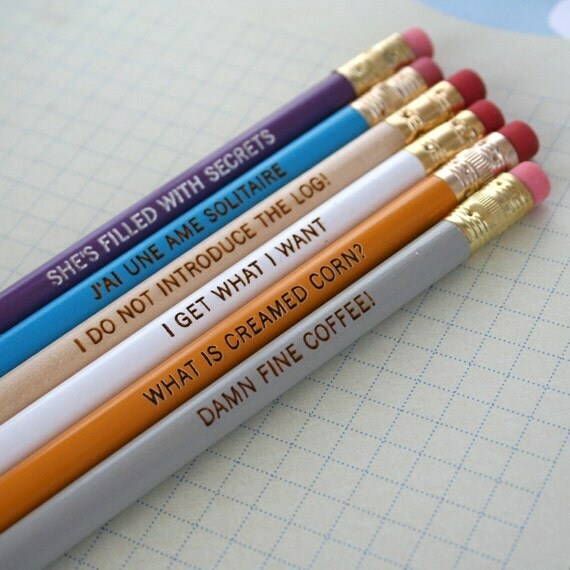 I need these pencils. 3. Danielle blogged about an amazing shop. I want to go there! 2. The top of this dress is so pretty! I bought these as kind of a last minute thing but I think they are becoming my favourite pair. The shape is even better in person and they feel so light on my face. Good pick! I am really excited about today so I better go hop in the shower and get myself ready or I will be left behind! I have been having such a great time staying with Kaylah this week and as much as I miss Ivan and the kitties I will be sad to go back home! We have got up to some pretty hilariously dorky stuff. Those glasses are really cute! I keep looking at that website and having trouble picking what I want!!! OH my! Those shoes are amazing! That picture of the pencils reminds me of those mood pencils Hot Topic used to sell, haha. Oh my, Twin Peaks pencils - love!! Awesome! I have a pair of Derek Cardigan glasses too, but in a different shape. Oh. And I looove those pencils ! oh vegan shoes, and so beautiful! thanks vor sharing! !